Carla Grima Atelier’s Summer collection is inspired by the multilayered notes hiding inside every perfect scent. Exclusive prints bring to life ‘scent and colour’ moments: bird of paradise, warm bronze summertime skin, fresh lemon and wild thyme…a feeling, a memory, a time and place you love. 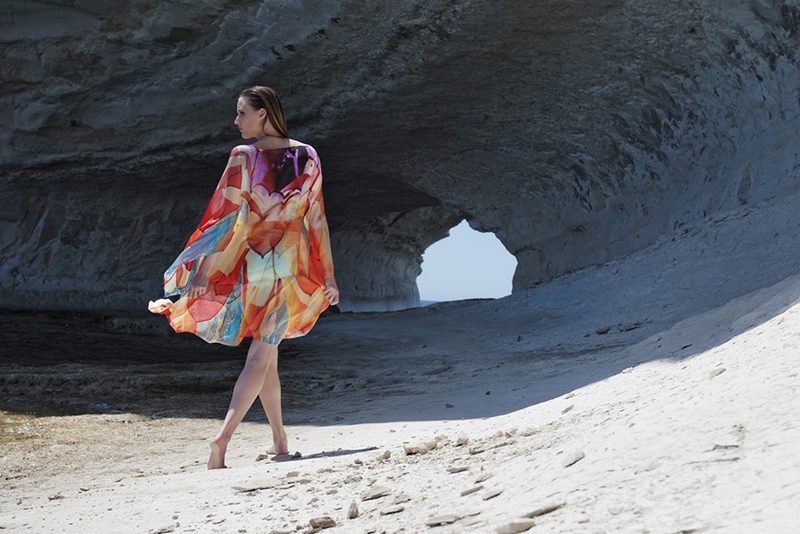 Each Carla Kaftan features a unique flower palette and the use of layered transparencies creates a flowing wearing experience. Float through the breeze, watch the sun set, golden days. These are high-quality, lightweight pieces made from natural silks and cottons, that feel free and match individual shape. From beach to sundown, eye catching and elegant; an essential addition to capsule wardrobes for summer 2014.